After booking my Coast Starlight train ticket I flew to Los Angeles for my event. At the end of my trip I made my way from the LAX car rental counter to the train via the FlyAway bus service from LAX to Union Station. When taking the FlyAway you enter Union Station in the back then proceed past all the train tracks back into the main hall. Coach passengers check in and queue at the boarding areas in the middle of the terminal. While first class passengers (those traveling in the sleeping compartments) are welcomed at the Traxx bar at the front of Union station. Complimentary juice and coffee were offered for all lounge passengers. Around 35 minutes before departure our conductors instructed us to walk with them to the train for early pre-boarding. We walked down to platform 10 and to the posted boarding areas for each car. Since I was traveling on train 14, the sleeper cars were numbered 1430, 1431, 1432, and 1433. I met my sleeping car attendant at the door to 1432 and headed in. I dropped my bag downstairs in the baggage area and walked upstairs to roomette number 7. 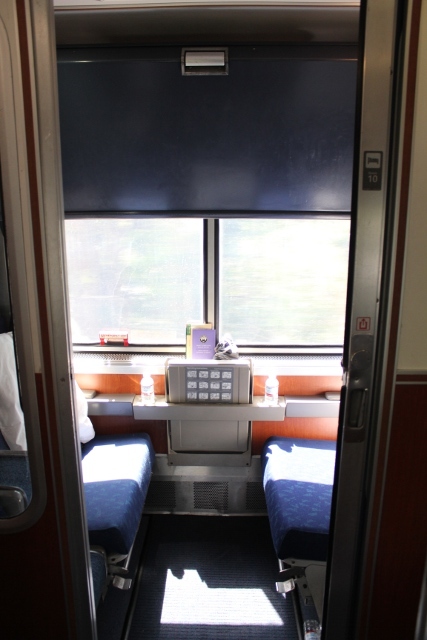 Unlike the east coast trains, the superliner roomettes don’t have toilets in the room which – to me – is a good thing. I’m not really sure what two people do when traveling together. “Ummm yeah, I have to pee, can you slide over a bit?” On these superliners there is one bathroom upstairs and several bathrooms downstairs. The upstairs is made up of 10 roomettes and 5 bedrooms. Downstairs are 4 roomettes, 1 family bedroom and 1 accessible bedroom. One thing to note on your room assignment: the sleeper cars are interchangeable and reversible so there is no way to be assured of which side of the train you will be on, until you board. In the end it doesn’t matter, even though my room is on the right (land side), there was space in the Parlor car, the Observation car and dining car whenever I’ve needed to see all the great views. Once I had deposited my things in the room and stowed my suitcase downstairs on the rack, I walked back outside to get some snaps of the train. This Coast Starlight train set included two baggage cars, three sleepers, the parlor car, dining car, observation car, and several coaches. As I walked past each car taking a picture I passed several Amtrak employees including dining car staff having a smoke, kitchen staff stretching their legs while sleeper car attendants awaited their next passengers. I have to say everyone was exceptionally friendly and professional. I reboarded and took photos of the inside of the train. Boarding early, as a sleeper passenger, was great as it gave time to see the train pretty empty. We departed right on time at 10:15am. As soon as we departed the departure announcements started. Unlike an airline announcement that is read from a card and the same each time – these announcements seemed to be off-the-cuff. First the cabin attendant explained the room features, the the parlour car manager explained the food options, movie options, and wine tasting. Then the restaurant service manager explained that she would take orders and come room to room. Then the customer service manager welcomed us aboard. Of course, that leads to issue number 1: Don’t take pictures of the room while balancing the champagne on the shelf. Needless to say as I raised the tray table for a photo and unfolded a leaf of the table, I knocked the bottle into the air for a Niagara Falls esque downpour all over the cabin, onto my lap, the seat, the other seat and the floor. Shortly after the food services manager came by to take lunch reservations. First class passengers (“sleeper” passengers) can have a simple lunch in the parlour car and get first choice of seating times for both the parlour and dining car. Unfortunately, by the time the food service manager got to my roomette, the parlour car was booked. So I opted for a later seating for lunch in the main dining car. Next a tour onboard the Coast Starlight.